We here at CB-Net do wave the flag for those un-sung heroes and this is one of them. In a time where Japanese multis wearing shell-suit graphics were the norm, there was a beautiful simplicity about the whole Ducati SS range. Its 600, 750, 900 and (barely decent) 400SS ‘Junior’ machines almost skipped into the capacity ranges dominated by the Japanese motorcycles of the day, but were – clearly – so very different as to appeal to both the Ducatisti and run-of-the-mill, middle-of-the-road bikers alike. The SS family was reborn in 1988, with engines based on the Pantah/904cc with a ‘traditional’ Ducati 90-degree, Desmodue V-twin with crankcases coming from the 851. Of course, it was placed in a trellis, steel-tube frame and the original model was the ‘750 Sport’. Issues included poor fuelling and swingarm cracks, but later models would improve and be larger (and smaller) in capacity. It’s beyond the scope of this piece to go into vivid detail about versions/upgrades and the like, but improve they did as well as coming in fully and half-faired versions. And – while the basic range went on until 2007 – we here only wish to talk about the pre-Pierre Terblanche machines: while we like the later models with the updated bodywork, we feel the pre-1999 models look the most ‘pure’ of all. If there are classic versions, we’d say the 1991 SuperSport range with white frames and blood-red bodywork are the ones to look out for, or perhaps the ‘Super Light’ versions with single-seats and number boards. Who cared if the 900SS was only pumping out 70bhp or so when it looked so ruddy good and could in the right hands, perform so well. 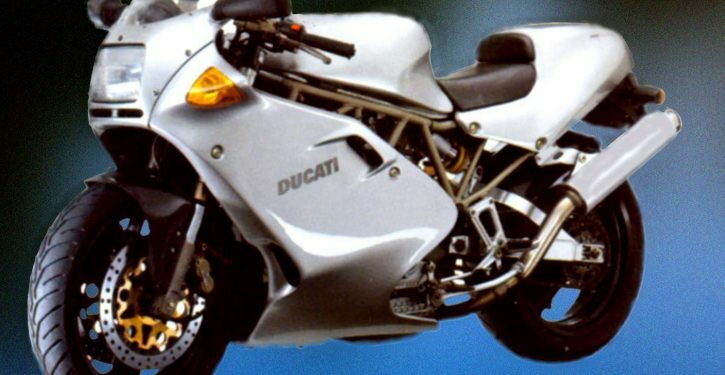 Finally in 1998, before the updated aesthetics of the Terblanche bikes arrived, Ducati celebrated the last of the carburated 900cc SuperSport air-cooled Ducatis with this, the ‘FE’ or ‘Final Edition.’ Only 800 were built world-wide with 300 going to the USA and the remaining 500 to the rest of the world. With its silver (we would guess it’s an Imola 1972 aping colour scheme) single seat and optional Termignonis, it growled and plucked on the heart strings in the way only a Ducati could. Want to hear a sad rumour? Well, apparently some of the FE models coming to the UK were re-painted red… why? A decade ago, you could have found one of these machines in the UK for around £2500 which was a bargain and six years ago any old pre-1999 900SS would have started at £1500. Well, read ‘em and weep. Even standard 900SS models now begin at around £3500 while the Final Edition (if you can find one) begins at £6500 with the Super Light starting at £5K. Engine: 904cc, oil/air-cooled 90-degree V-twin, four-stroke.